This Galco belly band holster quite possibly packs more options than any other holster on the market today! Galco's Underwraps belly band allows concealed carry of multiple weapons and accessories around your midsection, in an infinite variety of configurations. The galco UnderWraps bellyband also enables you to make instant additions and changes to your holster rig. 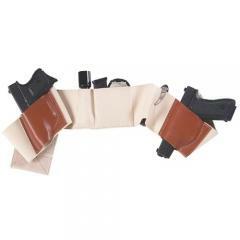 Two leather holster pockets facilitate stable positioning of one or two firearms simultaneously, while two accessory pockets accommodate handcuffs, badge, ammo--you name it! The UnderWraps can be worn like a traditional bellyband holster (low on your waistline, partially under your beltline or just above it), or it can be worn around your trunk mid-section (around the solar plexus area). Making the two gun pockets of leather extends the service life of the holsters, and stabilizes your firearms in the precise position and angle you prefer. Two elastic utility pockets add even more possibilities to this belly band holster. BEFORE CHOOSING SIZE DETERMINE IF YOU WILL WEAR IT AROUND YOUR WAIST OR LOWER CHEST. This is my 2nd belly band. Love them. I love this waistband, when I get my CWP it will be nicer than having holster clipped to pants or stuffed in purse. I like to keep weapons close. Very comfortable. I've been wearing both low around my waist and high under my arms and it has concealed my .38 very well.